My book about Germany was inspired by a visit to the country, a visit of just a few days and yet it opened a whole new history and perspective on how Europe had evolved. Surely a summer in Canada would yield a great deal more for, as a friend said to me, if three days in Germany produced a book what would three months in Canada do? The answer was, well, nothing, it left me unable to formulate any great passages or prose and I have often wondered why. Maybe looking at the images of the place two years on would offer up a cause so I thought I’d share a few thoughts of some pictures I’d brought back, maybe that will start the process. 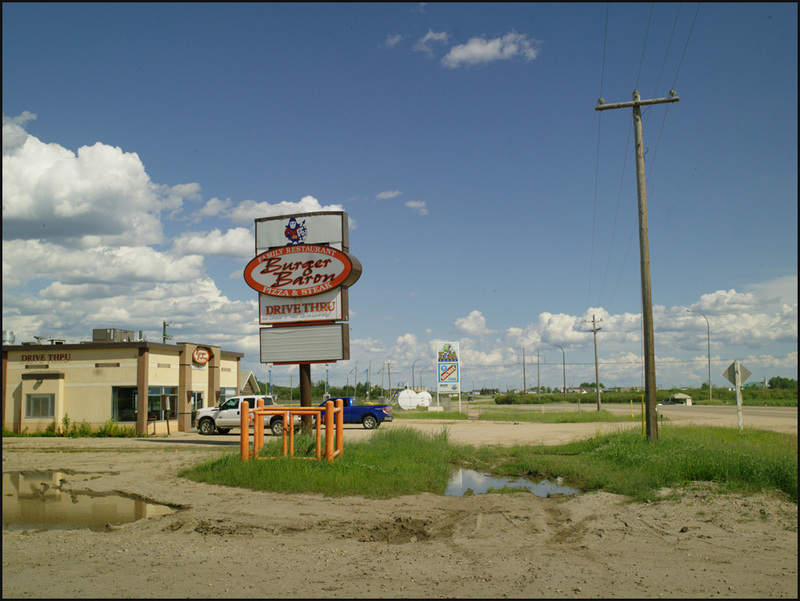 This is the town of Cold Lake, the town in which I was based. On the Eastern edge of Alberta it’s pretty much in the middle of the country. Its business is oil and fracking in particular. 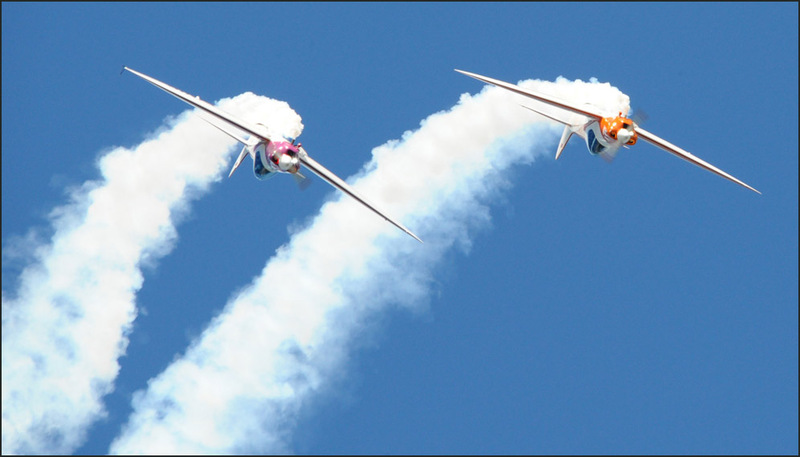 It also has a major airbase of some fame, but that’s for another day. Working on the oilfields pays well, very well, but not everybody can get in on the scene. It helps to be Canadian and it helps to be white. Of course that’s never stated, but hey, we all knew the rules. One of the regular highlights of the town was a car meet held a few times over the summer. Bring your ride and shoot the breeze at the A&W burger bar. 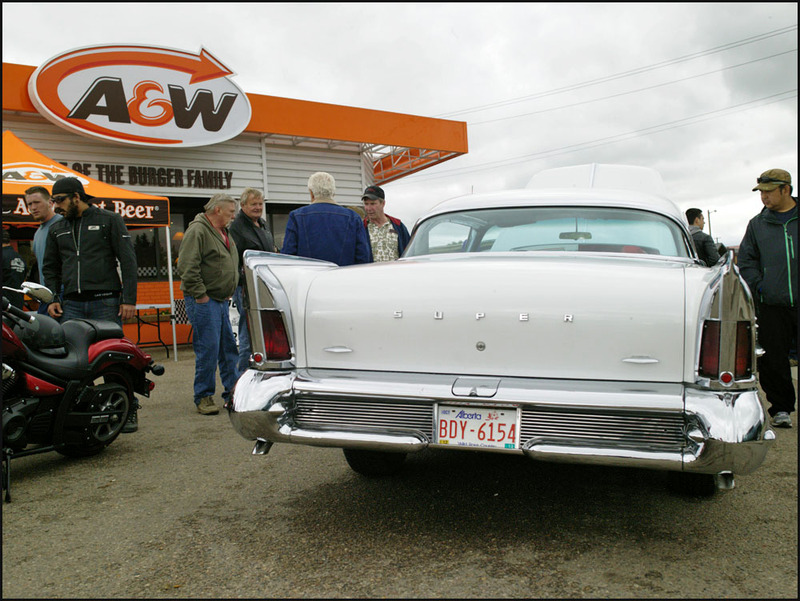 A&W are like moms apple pie to the Canadians, heritage is its greatest asset. They are mostly good old boys and most will chat to ‘foreign workers’ but not all. Ardmore. Well it’s there on the map of the state and on the ground as well. This, I think, was its biggest building, other than the ‘shops’ as the workshops that service the oil industry are known. Places where you buy stuff are called stores. I never knew this hotel or cafe to be open although I was assured they were still in business. Funny that, but I never pressed the question. A crossroads, a store and a hundred houses or so comprised the rest of the town. Dusk at Cold Lake and the town had closed down. This truck was unloading something into a store, although there didn’t seem to be any great quantities involved. 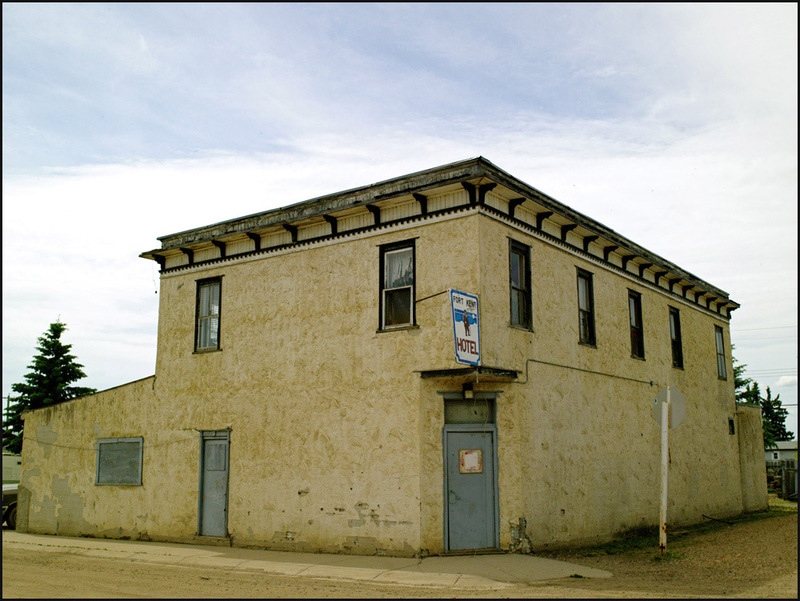 The electricity wires were safer in the air than under the barely made ally that ran down the back of the main street, aesthetics were not the major concern in Cold Lake. I thought this place deserted, abandoned, as plain a building as can be imagined with only false optimism of better days to come preventing it from being a ruin altogether. But no, once or twice a week it comes to bawdy life as ladies divest themselves of their clothing for the entertainment of the menfolk. Strip clubs are popular in Canada, but never spoken off in polite circles. This was at Fort Kent, a town smaller still than Ardmore. Across the road, literally, from the den of ill virtue was the church, and this was a wedding one Saturday morning. 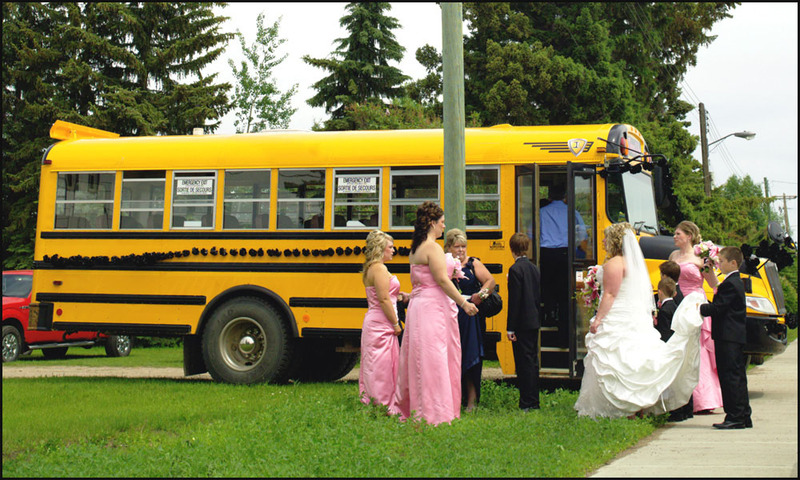 The bride was brought to the place by school bus, specially dressed for the occasion and driven by her father to whom, as I understood the situation, it belonged. The church is of mid European origin and the pastor,as well as much of the congregation, spoke in a tongue that was akin to German, but I recollect not what it is called. It is the custom for the bride to be the last to enter the church, alone, and she cut a strange figure, outside by herself, waiting for her cue. 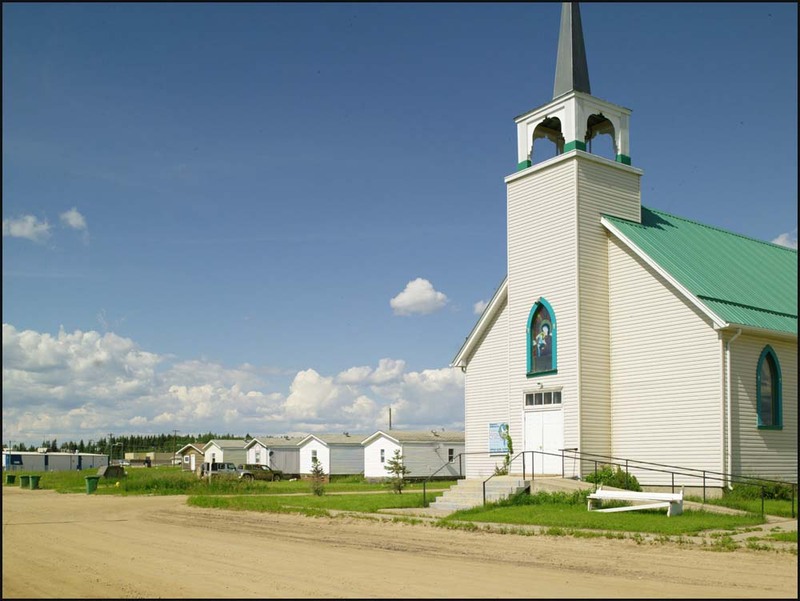 A catholic church this time, at a town called Wabasca Desmarais. Oil once again brings men and women here, to this place from which no read leads except the one you came in on heading north, and the one you leave on, heading south. It’s the same road, you are at the top of a loop. There is, incredibly enough, a tourist office here and I remember the pretty girl, bored out of her skull, being bedazzled by a lonely traveler who had ventured this far. She recommended a motel, the only motel, but they knew the price of oil and the generous allowances of the usual visitors and charged accordingly. I demurred and pressed on. 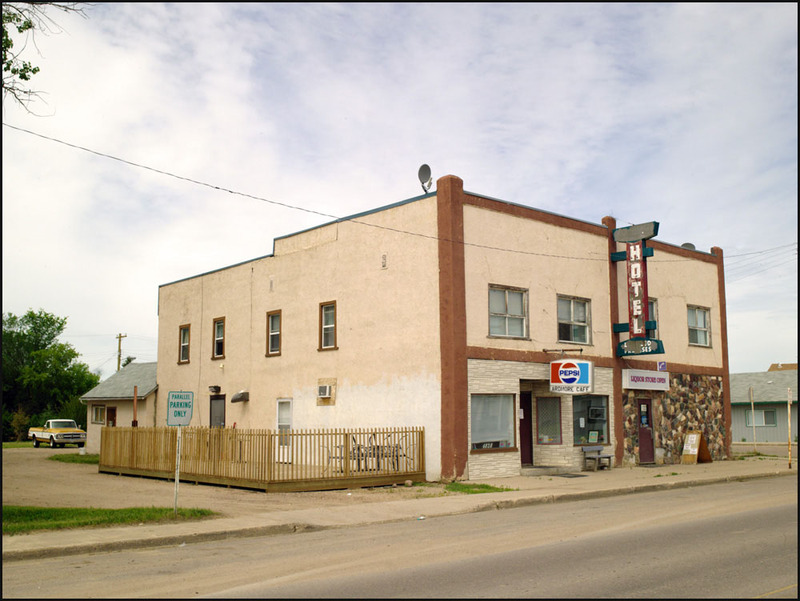 A burger bar at Wabasca Desmarais, there was another, much posher, one that called itself a restaurant, but they, like the motel were not afraid of asking big numbers for the privilege of crossing the threshold. This was where we others ate, a big sky and lonely poles being the major features. And the sky is big, and there is space, lots of space with buildings like this tacked upon its surface. Nothing seems anchored to the landscape, only the legends carried by the lore of the first nations, all else is fluff and temporary. 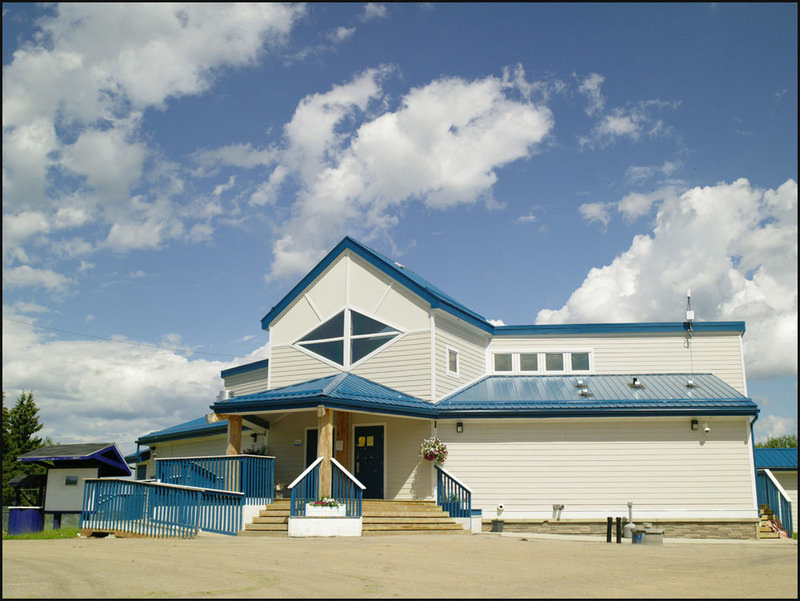 Which brings us back to the community centre at Calling Lake. Built on a reserve, a stranger has the right to be in this public place, but we were warned never to stray from the ground that is recognised as being shared. We don’t know it over here but there is a terrible chasm that lies between the first nations and the settlers in the outback of Canada. It is a creation of distrust of the whites who in turn seem to fear the native population. It is a tragedy. Perhaps I was offered the chance to bridge it, I shall never know for sure, but by then I had recognised that this country, beautiful as she can be, was not my home. This entry was posted in Uncategorized on September 27, 2015 by Triplemanr. Do we really know where we are going with web marketing? Now don’t get me wrong, I’d be the first to point out what an incredible feat of engineering the internet is and the ability of the WWW to disseminate information in such quantity and at such speed fills me with awe. It’s exponential rate of growth over the past two decades has also been phenomenal along with the realisation of the digital world of which it is a major part, yet the web is now suffering from its own cleverness, it has reached a point where one starts to ask; what is the point? The problem is that the the majority of information that we are presented with is trying to sell us something, not just physical goods but also financial services, programmes (apps if you must) political and religious ideas and ideals and plenty of other ‘stuff’ that we neither want nor care much about. Those of us who actually want to find out things, useful facts and so on, are left to pick our way through this lush jungle of colour to try and find occasional morsels of meat amongst the empty promise of bamboo shoots. This brings me on to my second declaration where I would point out that I am not against using the web as a sales channel per se, not at all, however, in the minds of far too many this has become the sole reason for it’s existence and we need to remind ourselves that this is not the case at all. We’d all do well to sit back with a coffee and reflect upon what the web is actually meant to be about rather than try and devise ever more intrusive ways to impose a product on peoples conscience in the hope that they might buy it, because that is ultimately counter productive and I think we are already seeing the law of diminishing returns coming into play. I look around the web, I read the the various self elected gurus pontificating on the finer points of the latest piece of genius they have alighted upon, I see the hollow blandness of ‘white space’ being elevated to an art form to cover for the idleness of not doing a proper job, I listen to those who pretend they hold the key to the dark art of web marketing and I really struggle to connect much of it to the world that the rest of us inhabit. Yet they continue to fill the bowl with the popcorn of futility and wonder why they are having to run ever faster just to keep up. I should, at this point, also point out that there are companies who aware of the pitfalls and perils of overselling themselves on the web and strive to create an informative and intelligent presence that compliments an overall marketing strategy rather than replacing it entirely. Balance and planning are good things, but not always present in any great quantity. To illustrate what I mean there is one particular basic fact of commercial life that is so often overlooked that one feels that it is deliberately ignored for fear that it might upset the pretty fabrications of the experts, and that is every business is different! I know I know, it must come as a shock to the lads and lasses who take an abstract concept of what a business actually is and then try and apply a standardised answer not realising that this is the reason they are so often ignored. A self employed person providing a service such as plumbing or printing has not the same aspirations and needs as a multinational, nor may they appeal to the same customer base, sorry, cohort. Big companies have the resources to set up and target a web based marketing campaign with constant adjustments and updates, smaller firms generally do not, so why talk about them as if they have? These disparate factors have led to all sorts of answers being sought and the flooding of the web with nonsensical attempts at flogging stuff because everybody believes there is one magic song sheet to sing from, there isn’t! So if we are going to discuss web based marketing strategies then we need to make it quite clear as to what sort of businesses we are addressing our concerns, advice and comments before jumping on a bandwagon and driving it down everybody’s throats without a thought as to whether it is a suitable pill or not. As I stated at the beginning, the internet and web are incredible achievements but I fear we do stand to lose many of the opportunities they present through careless and unthoughtful pursuit of a common ideal. One size does not fit all, nor does the web have all the answers, printed media is still very valid as an advertising tool in many fields, but that’s another blog altogether. This entry was posted in Uncategorized on September 20, 2015 by Triplemanr. 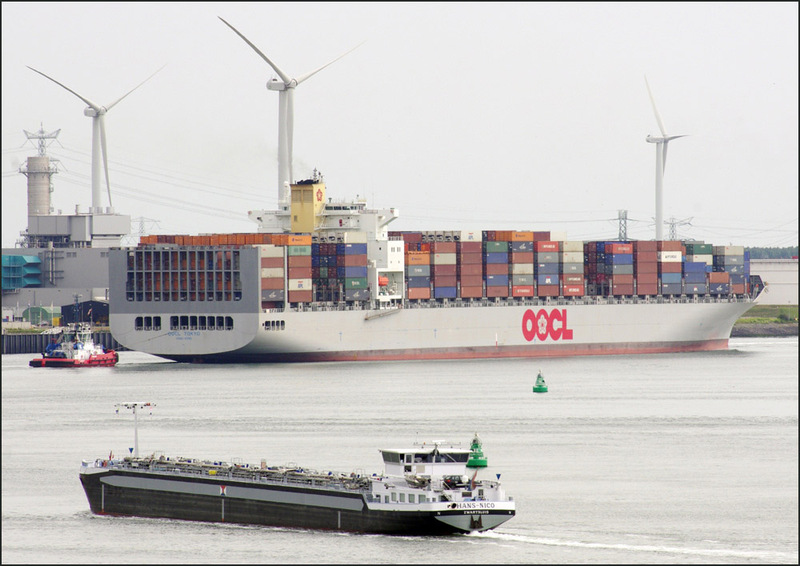 Windmills and trade, the Dutch will never change! Since a college trip of far too many years ago the hours that I have spent in Holland can be counted upon one hand, yet I still feel I know the place, hold an empathy and share their concerns although it would too far fetched to think of it as a second home. I am also of the notion that I would not feel out of place in the country, nor that I would go without company or good cheer should I ever find myself there for any length of time such is the feeling of fellowship I have enjoyed with the Dutch over the years, they are, I think, perhaps the most closely aligned to the sort of Englishness that I am familiar with than any other European nationality. As one or two readers of this blog may have noticed I am rather keen on visiting France, and it is mainly because many Dutch also enjoy doing so that I have got to know them over the years. No self respecting French campsite could consider itself successful without a solid collection of camper vans bearing the letters NL on their number plates, nor would any ferry trip be complete without having at least one lengthy conversation with a Dutch family keen to practice their English, and so it is by degrees that the relationship with them has grown to a feeling of familiarity that I have yet to share with any other nationality, other than the Irish amongst whom I live. Despite this it is not always an unbridled rapture I experience whenever I meet any one of their number, they too have their habits and peculiarities which they carry with them when they spill out of their tiny overcrowded country into the open air of rural France or wherever they are heading. Many a time I have seen a caravan pull up and almost the first item to be attended to is the satellite dish which is carefully pointed in the appropriate direction before being swiftly followed by the inhabitants withdrawing inside rarely to be spied again. Fair enough, if a holiday is watching the box within a different set of walls while a happier form of life goes on around you then so be it, but it is a rather sad state of affairs to see telly gazing raised to such prominence in anybody’s life. On the other hand they can be immeasurably hospitable. One such occasion involved a vegetarian couple inviting an obviously lonely looking biker to a supper of salad and beans. Unfortunately the reaction was as catastrophic as it was predictable so I suppose it was kind of mother nature to ameliorate the situation with a gentle breeze that may have freshened the air but could hardly disguise the rumblings and eruptions emanating from their guest. The raven haired lady thought it was quite hilarious and could barely disguise her mirth which thankfully went some way to easing the embarrassment as well as demonstrating that other great Dutch trait, a rugged honesty that does not shirk from telling it as it is. As we said our farewells the next morning the laughter was still in her eyes and often since I have wondered whether it was a regular joke they played. But that aside it was an interesting evening with much intelligent conversation, banter and reaffirmation of a common bond that lies between the Dutch and many of the English. I say many of the English for I cannot speak for all of them, let alone the whole gamut of ‘the British’. The Welsh I know for fact are more akin to the Bretons of France while the Scottish and Irish have always felt closer to each other than either to their past tormentors, which leaves the English somewhat alone except for the Dutch and some Nordic affiliation for those living at more northerly latitudes. 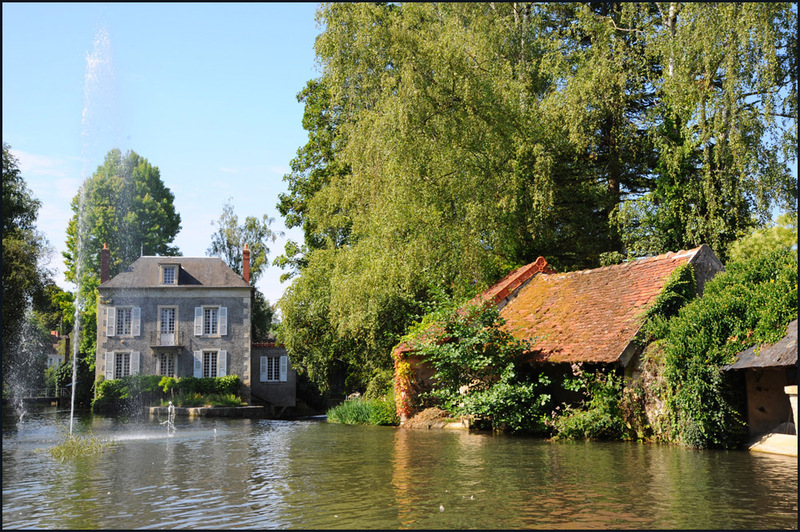 Having been reared mainly in the southern counties the lands of Normandy never struck me as different or particularly foreign in appearance and I need to be beyond the region before I feel I have arrived in France for real. The people though, are delightfully French from the moment the ferry docks and that Frenchness is quite different from our Englishness and the Dutch’s Dutchness, yet when we are abroad the people from England and the Netherlands will tend to associate with each other far more readily than they will with other nationalities and many a pleasant memory is associated with their companionship. I really ought to get over there sometime and get to know them at home. This entry was posted in Uncategorized on September 11, 2015 by Triplemanr. The Fine Delight of Riding. Donzy, A quiet corner discovered by bike. Coming off the roundabout in a gorgeous sweep to the right the bike lifted her head in anticipation of the road ahead, so much so that there would have been little response to any attempt at steering yet I knew her trajectory was right and with the throttle eased she settled back to her normal stance, centred in the lane and pulling away nicely from the flashing blue lights of the two fire service trucks passed out on the exit from the island. Now what, you may ask, was any biker or motorist doing overtaking emergency vehicles responding to a call, especially at a junction? But when I tell you that the second vehicle of the pair, a Series III Land Rover with a trailer, seemed impatient with the first, those who know of the woeful lack of speed in these otherwise fine off roaders will understand that their rate of progress hardly matched the urgency of their mission. And I was not alone, a fellow on Gixxer 1000 had been trailing me through town and now the way was clear he came past with a wave of the leg and a rush of acceleration that I had no hope of matching encumbered as I was with the luggage of a fortnights touring. It is for these moments of joy that we bikers live. My greatest wish would be that I could place them in a bottle and share with all those who question the wisdom of riding and after those days in France that bottle contained not just the one surge of life affirming exultation but many many more examples of what the passion is all about. Every hour on the bike would grant seconds or even minutes of complete serenity, of a connection with a meaning that transcends the monotonous and ridicules the regular, it brings a purity of thought that I seldom experience elsewhere although I am sure there are other activities in which the participants would claim the same awareness brought about by this sense of power and total responsibility for your own destiny. It is a bliss, a zen like state that one can savour but must not wallow in, for that is the path to misfortune. Yet biking is not all about the thrill of control, there is so much more it offers. On the same day that I met the local fire service earnestly urging modern tractor speeds from their appliances I had sauntered along unknown roads that no tourist would consider the need of visiting, passed through quiet villages with churches that were at once far too magnificent for the humble collection of houses gathered around, tripped over hidden chateaus that boasted vineyards of note to only those who truly know about wine and gardens that had been freshly brought down from paradise that very morning. Shunning such wretchedness as a GPS, relying only upon a map to provide the names of two towns between which I would travel and keeping the sun to my left or to my right as a guide to the general direction I should be heading I would set off in the confidence that I would arrive and that France would share her soft bosom of visual ambrosia on the way. I am very rarely disappointed. And that is just France. Ireland will also offer up her secrets to those who shed the concerns and strictures of the guide book, who understand the word travel as a synonym for exploration and discovery in an unhurried manner. She too has roads that will truly engage the biker although their character is less open and foreseeable, instead, she has hidden corners and challenges that will call for an alertness and an ad hoc planning regime in the business of maintaining motion that the manuals will rarely mention in fear that it counter their beautiful arguments of roadcraft. But let that not discourage those who are willing to show an independence from the rule book that the Emerald Isle requires if she is to be enjoyed as she should be, at a pace of your choice and in a mood of contemplation rather than wild exuberance. If you have kindly read these words so far I do hope that you are perhaps a little wiser as to the pleasure and satisfaction that informs the choice of many of those who ride, who eschew the comfort of a car when wishing to travel and learn a little of other places. 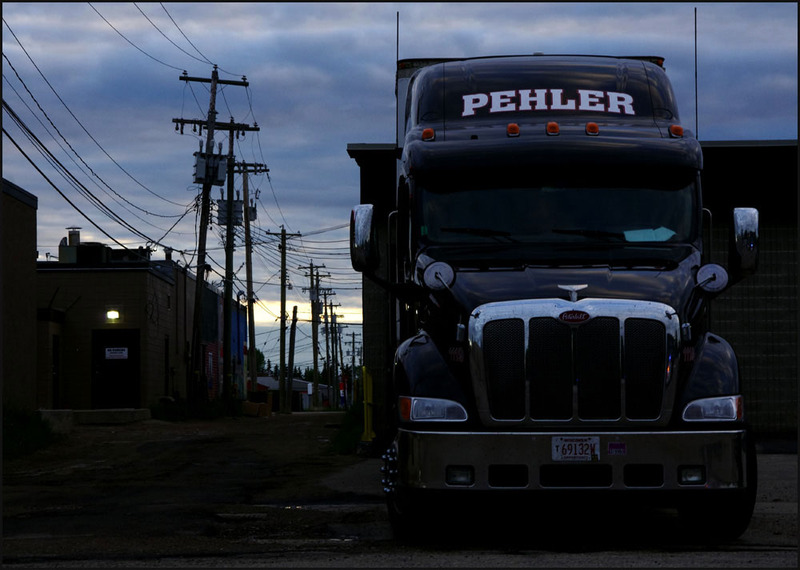 It is perhaps the most rewarding way to transit or tour, the thinking man’s driving no less. This entry was posted in Uncategorized on September 1, 2015 by Triplemanr.